The first of the monthly property data is in and it does not bode well for those thinking / hoping that the election in September had in some way held back the market and that the traditional Spring surge would arrive albeit late in October. 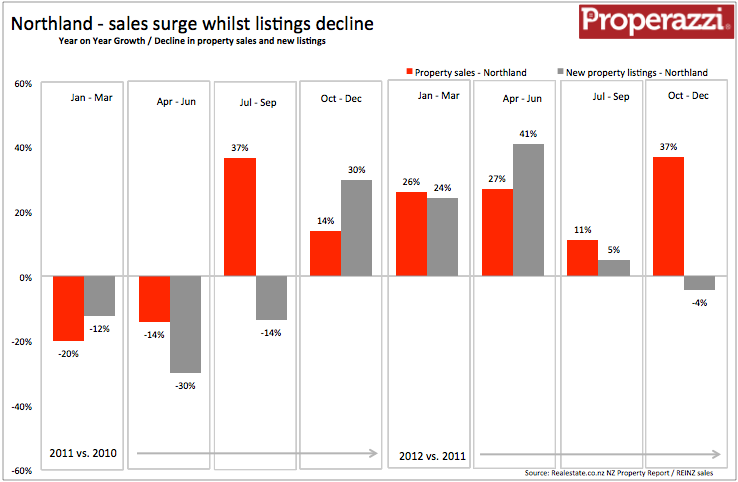 Sales as reported by Barfoot & Thompson were down on last month and last year. Now normally sales volumes in October are around 10% higher than sales than September, this year sales for Barfoot & Thompson in Auckland fell 2% compared to September and as measured against last October sales were down 22%. 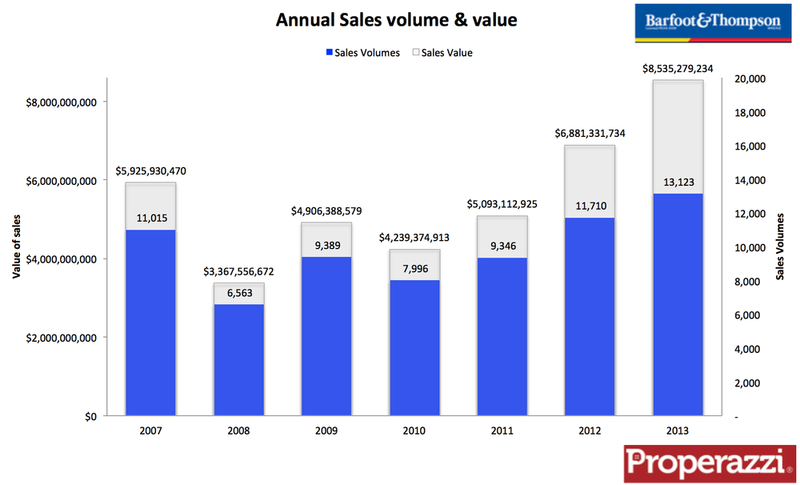 October was the 9th consecutive month to show year-on-year declines in sales volumes. 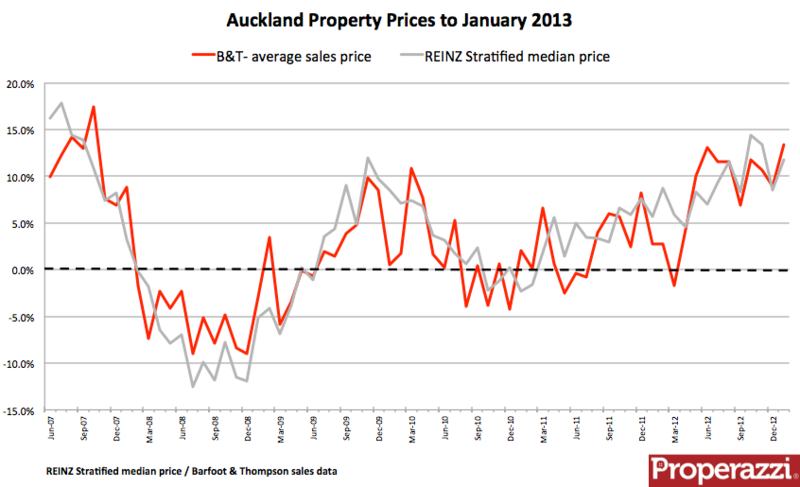 Measured on a 12 month moving average sales in Auckland for Barfoot & Thompson has fallen from a peak 12 month total of 13,232 in October last year to a total in the 12 months to date of 11,699. Barfoot & Thompson is a fairly accurate bell weather for the national statistics which have seen the same trend of moving annual total peak a year ago and continue to decline through this year, resulting in what is looking to be a 2014 calendar year total sales of just 70,000 down from 80,000 in 2013. Delving into the richer analysis of property sales by price range shows a continuing trend of fewer sales in the lower price segment of the market in Auckland. 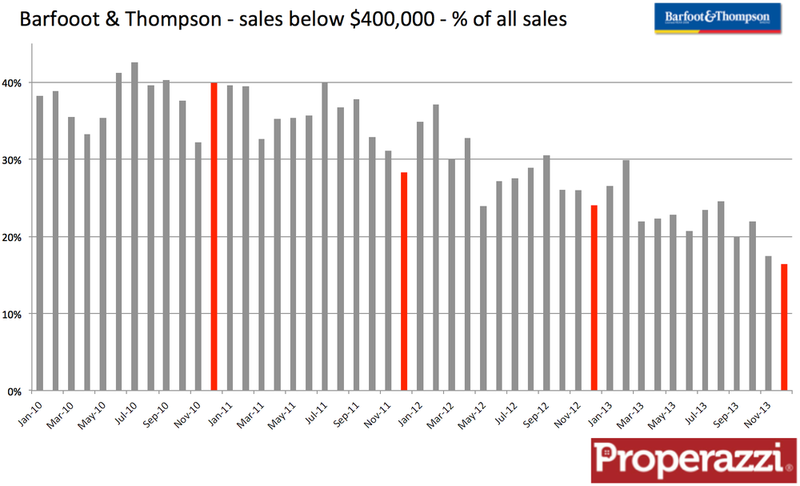 Barfoot & Thompson October sales in the $400,000 and below segment amounted 126 of the 939 total sales in the month, that represents just 13% of all sales. A year ago that segment represented 22% of sales and back in 2010 38%. These numbers reflect the combined impact that as the median price creeps ever higher in Auckland (Barfoot &Thompson Oct '14 $655,000) there are simply less properties to buy and therefore to sell below $400,000 added to which the LVR impact has hit this segment. The $400,000 and below segment is fast disappearing from the Auckland property landscape. I guess in someway we all intuitively knew it. We knew that the sense of another property market bubble was merely the frothy demand in the biggest city in the country. 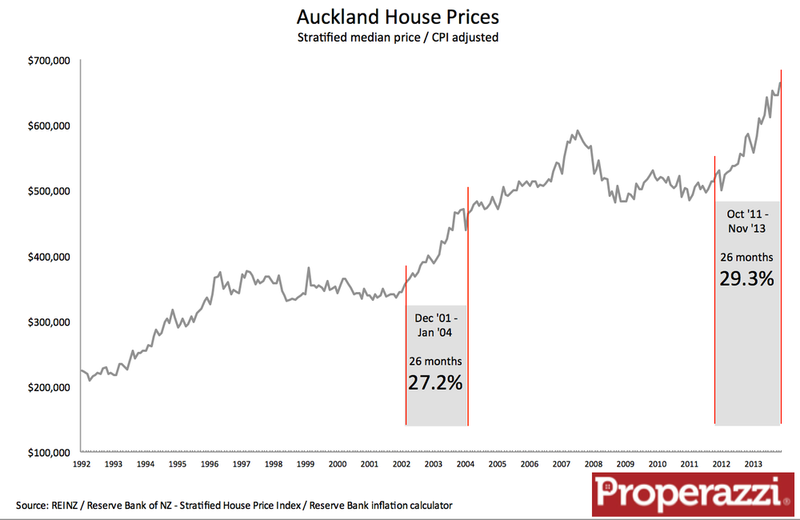 Well now we have the data to back it up – to give us the picture that supports the assertion that the general picture of the property market outside of Auckland is a lot less frothy than we find in the metropolis of Auckland. Let’s look at the facts. Auckland is home to 1.38 million people, that’s just over 31% of the population. It has around 480,000 dwellings which represent around 29% of all the dwellings in the country. 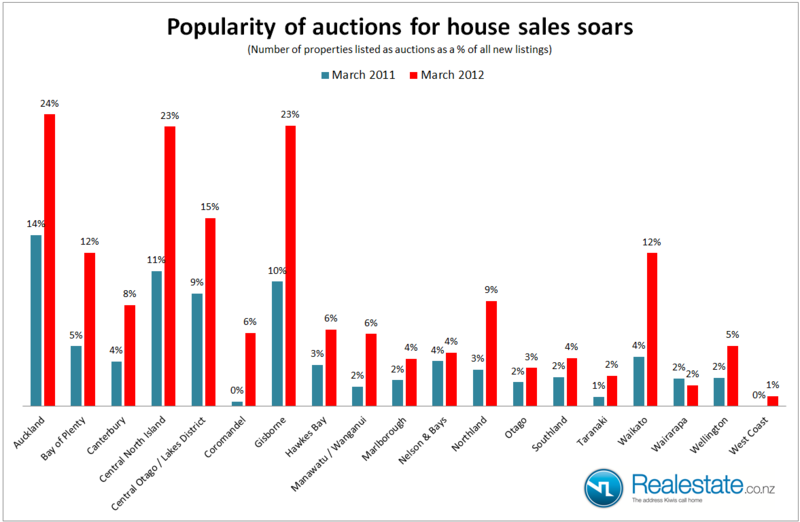 Now compare that to the fact that for 18 months Auckland property sales has represented more than 35% of the national sales and each month for the past 18 months, Auckland sales have represented more and more of the national sales right up until last month when on a rolling 12 month basis it hit 37% of all sales. The red line which represents the 12 month moving average share, has been growing steadily since the low point in mid 2008 when it was down at just 30%. At that time the representation of Auckland of the total national volume sales reflecting a truer representation of the city’s share of the national total of people and houses. Looked at on the basis of comparative sales volumes on a rolling 12 month basis shows in the chart below how Auckland property sales actually fell at a faster rate through the collapse of the property market from 2007 through to 2009, however since the start of the recovery in mid 2010 in Auckland (and 6 months later in the rest of the country), Auckland sales have outpaced the rest of the country. 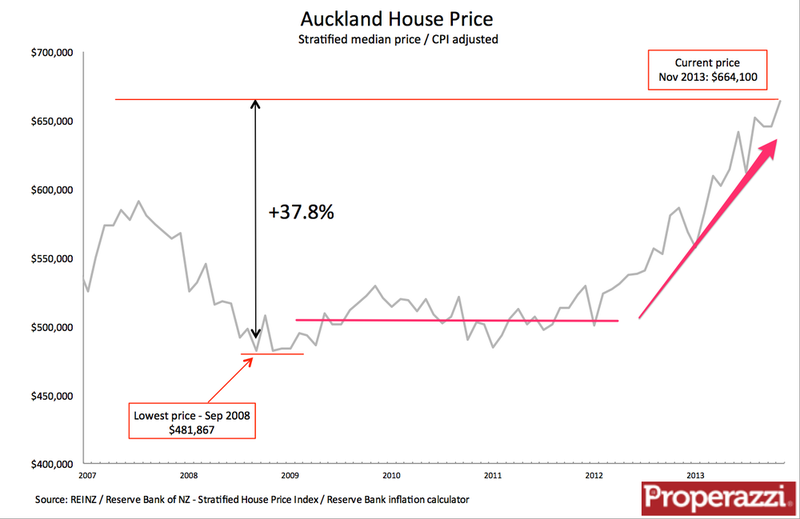 For clarity the chart above shows from the red line (read off the right hand axis) property sales in Auckland; whilst the grey line (read off the left hand axis) shows the total for the rest of NZ in total excluding Auckland. What is very interesting is that if you look closely at the most recent data points of the past 2 months the total property sales for the rest of the country excluding Auckland is beginning to fall off. 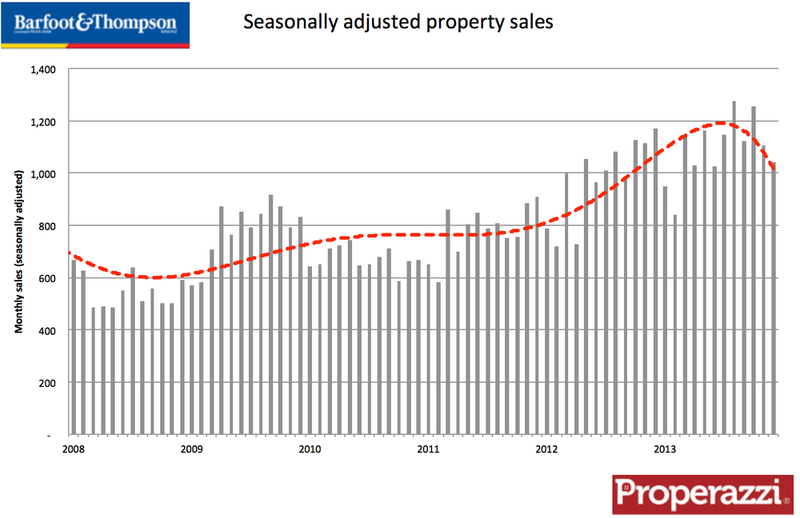 This trend of a plateauing level of sales outside of Auckland is more conspicuously highlighted in this final chart which, tracks the rate of growth (or decline) for property sales in Auckland and the rest of the country over the past 5 years. That rate of growth year-on-year for the rest of the country is heading down indicating the plateauing of sales for regions outside of the powerhouse of Auckland that is driving the overall market.